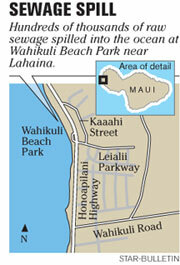 Several hundred thousand gallons of raw sewage spilled from a Lahaina sewer line Thursday night and flowed into the ocean at Maui's Wahikuli Beach Park before the line could be patched, county and state officials said yesterday. The spill from a 21-inch-diameter pressurized pipe that serves all of Lahaina was reported at about 7 p.m. Thursday by a resident who noticed sewage bubbling up through the ground at a little-used portion of the beach park, said Maui County waste-water division chief Dave Taylor. Crews were able to stop the leak, which was makai of Honoapiilani Highway, between the civic center and Canoes Restaurant, and make a temporary repair by midnight Thursday, Taylor said. The area of the park affected was cleaned up, he said. The iron pipe, which had been installed in the 1970s and was scheduled to be replaced in 2011, had a 1-foot-wide hole in it, Taylor said. The temporary repair made Thursday night was to be made permanent with the addition of cement around it last night, he said. The work must be done at night when sewage flows are low enough to store sewage while the work is being done on the pipe, Taylor said. The exact amount of the leak was not available yesterday because it has to be calculated by combining different sources of information, he said. A manager at Canoes Restaurant said last night that the spill occurred about a mile away from them and did not affect business. Maui County posted signs warning of the contamination at the beach park, which are expected to remain in place over the weekend, said Mike Tsuji, enforcement section supervisor for the state Health Department's Clean Water Branch. Water samples were taken yesterday and will be taken through the weekend, but the test results are not expected before Monday, Tsuji said. It is standard procedure for the state to require contaminated-water postings at the site of a sewage spill, only allowing their removal when water testing proves that affected water is within the state's limits for bacteria. The Lahaina spill came the same day that the state Health Department and the U.S. Environmental Protection Agency announced they were fining Maui County $4,000 for a 1.4 million-gallon sewage spill in Kahului in December.